» Tour Duration: 480 min. 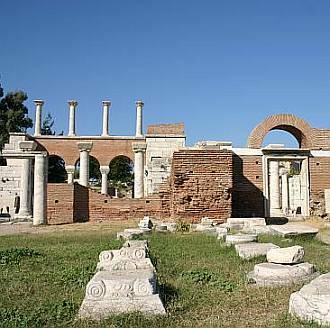 Biblical Ephesus tour is focusing on the Christian background of the monuments in and around Ephesus ancient city. Inside Ephesus Ancient city, you are going to visit: Odeon, Domitian Square, Memius Monument, Nike, Hercules Gate, Curates’ Street, Trajan Fountain, Latrines, Brothel, Library and the Grand Theater. The House of Virgin Mary is believed to be the house where Virgin Mary spent her last days. The Church of St.John is where John the apostle was buried for 5 centuries. The Temple of Artemis used to be one of the seven wonders of the ancient world which is entirely in ruins today. Copyright © by Ephesus.net 1998-2019. All Rights Reserved. Nothing contained on this website may be reproduced without express written permission. Ephesus.net does not assume responsibility for errors or omissions in the content of this website.